Thanks to the partnership between Kentucky financial institutions and the Kentucky IOLTA Fund, the Fund is able to make significant contributions to support legal and pro bono programs across the Commonwealth. Financial institutions are a vital component of the success of the Kentucky IOLTA Fund throughout the Commonwealth. Banks voluntarily partner with Kentucky's legal community by enrolling in the IOLTA program. Numerous banks contribute even more by paying favorable interest rates and waiving service fees on IOLTA accounts. Additionally, the banking representative on the IOLTA Board of Trustees generously provides invaluable insight and assistance to the IOLTA program. read our article in Kentucky Banker magazine. What financial institutions already participate in the IOLTA program? The Kentucky IOLTA Fund is proud to partner with 158 Kentucky banks and welcomes partnerships with many more. For a list of the participating banks, click here. Where can I obtain the agreement for my bank to participate in the IOLTA program? Financial institutions wishing to participate in the IOLTA program simply complete, sign, and return an Agreement to Participate. To request an Agreement to Participate, contact Program Manager Gwen Smallenburg at gsmallenburg@kybar.org or (800) 874-6582. When a completed Agreement is received by the IOLTA office, the bank is enrolled as a participating bank in the IOLTA program. The enrollment will be acknowledged by the IOLTA program, accompanied by a fully executed copy of the accepted Agreement. Attorney enrollments on file at the IOLTA office are immediately remitted to the newly-enrolled bank, with a request for their conversion to IOLTA accounts at the bank's earliest convenience. To assure proper handling of escrow accounts, the IOLTA office should be viewed as the starting point for the enrollment process. Therefore, all attorney authorization forms must be forwarded to banks by the IOLTA office. Attorneys presenting IOLTA authorization forms directly to financial institutions should be advised to send the forms to the IOLTA office. How does my customer enroll his or her account as an IOLTA account? Kentucky attorneys may either submit the Authorization for Kentucky IOLTA Account form online here, or they may print and mail in a hard copy of the form to the Kentucky IOLTA Fund, 514 W. Main Street, Frankfort, KY 40601-1812. The name on the account is changed to: "KY Bar Foundation IOLTA Account for (name of attorney or firm)." This is necessary to prevent the Internal Revenue Service from issuing a "B" notice to the lawyer because the named holder of the account and the tax identification number do not match. The Kentucky Bar Foundation, Inc.'s nonprofit tax ID number should be added to the converted account as the recipient of interest generated by the account. What interest rate is required for an IOLTA account? The Kentucky IOLTA Fund respectfully requests that participating banks consider paying a minimum interest rate of 1.00% on all IOLTA accounts. We are pleased that many banks have demonstrated a commitment to IOLTA Fund's mission by paying interest or near at this level. Participating financial institutions that maintain IOLTA accounts shall pay on the accounts the highest interest rate or dividend generally available from the institution to its non-IOLTA account customers when IOLTA accounts meet or exceed the same minimum balance or other account eligibility qualifications. In determining the highest interest rate or dividend generally available from the institution, participating financial institutions may consider other factors, in addition to the IOLTA account balance, that are customarily considered by the institution when setting interest rates or dividends for its non-IOLTA customers. Such factors should not discriminate between IOLTA accounts and accounts of non-IOLTA customers. (i) Pay an amount on funds that would otherwise qualify for the investment options equal to 70% of the federal funds targeted rate as of the first business day of the month or other IOLTA remitting period, which is deemed to be already net of allowable reasonable service charges or fees. The foregoing option of paying 70% of the federal funds targeted rate shall only apply when such rate is established in the range of 1.0% to 4.0% unless otherwise agreed to by IOLTA and the participating financial institution. (ii) Pay a yield rate specified by IOLTA, if IOLTA so chooses, which is agreed to by the participating financial institution. The rate would be deemed to be already net of allowable reasonable fees and would be in effect for and remain unchanged during a period of no more than twelve months from the inception of the agreement between the financial institution and IOLTA. How often must banks remit interest on an IOLTA account? Banks participating in the IOLTA program have the option of remitting interest either monthly or quarterly. Banks are required to designate whether they elect to remit monthly or quarterly when they complete their Agreement to Participate. What information is an IOLTA bank required to report about its accounts? Adhering to the time schedule selected by the bank when the Agreement to Participate was signed, the bank should report all interest generated on IOLTA accounts by account number. A form for this purpose should be requested from Program Manager Gwen Smallenburg at gsmallenburg@kybar.org or (800) 874-6582. We ask that each account listed include attorney or firm name, average balance, APY, gross interest, any bank fee charged,* and the net amount. The report is then totaled, and the net amount due to the IOLTA Fund should be remitted to the Fund either via a check mailed to the Fund or via an Automated Clearing House (ACH) transaction initiated by the Fund. Many banks find it helpful for reporting purposes to have all IOLTA accounts in the bank on the same monthly cycle. *Banks are allowed to deduct reasonable service fees from IOLTA accounts. However, due to IOLTA's charitable nature, many participating banks contribute even more to IOLTA's success by not charging service fees on IOLTA accounts. Charges relating to overdrafts, purchase of checks, wire transfers, etc. remain the responsibility of the attorney. Do I need to issue someone a 1099 at year's end relating to an IOLTA account? No. 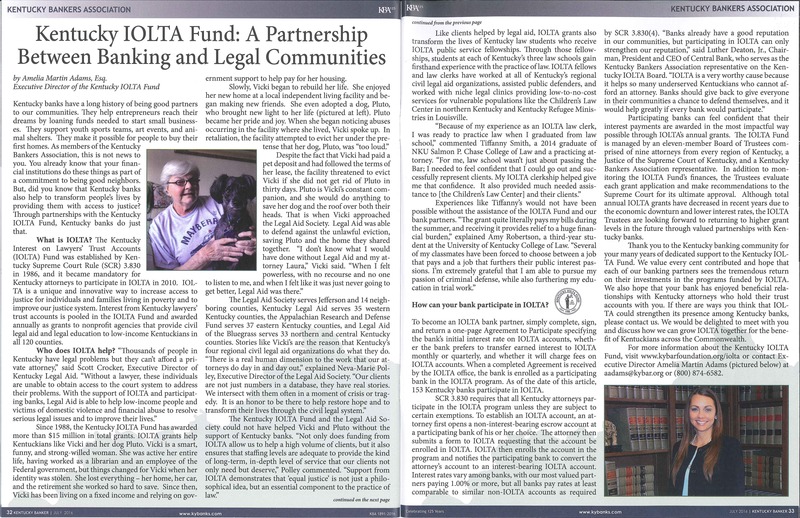 Since IOLTA is a special fund of The Kentucky Bar Foundation, Inc., a 26 U.S.C. § 501(c)(3) tax-exempt organization with beneficial ownership of interest generated, it is not necessary to issue a 1099 at year's-end because the interest is exempt from tax under federal and state tax laws. However, any 1099 issued should be mailed to the Kentucky IOLTA Fund, 514 W. Main Street, Frankfort, Kentucky 40601-1812. What if an IOLTA account at my bank is closed? If an account is closed for any reason, the closure should be noted on the next report immediately following the closure. Where do I send a notice of an overdraft on an IOLTA account? If an IOLTA account is overdrawn, notice should be sent to the attorney or firm who maintains the account. Notice does not need to be sent to the Kentucky IOLTA Fund. call the Kentucky IOLTA Fund office at 1-800-874-6582.